Is your place of work being bogged down by a gate that's no longer working as smoothly as it used to? Don't worry! We'll be able to get to the bottom of the issue in no time and determine the best solution for it. The opener is what powers everything, and that means it'll be noticeable when it has become worn down over the years. Thankfully, we can get it repaired in no time and working like a charm again. The problem may simply be that the gate isn't aligned properly anymore, but we'll get it back where it needs to be. We understand that you don't want the coming and goings of your business to be held up for long, so we'll tend to everything as quickly as possible without losing integrity. Sometimes you might not have a clue what's going on with your gate, and that's okay! It's what we're here for. One of our technicians would be happy to inspect your gate and opener to troubleshoot and get to the bottom of whatever the problem might be. We can also provide safety testing to help you rest assured that pets or children will be safe if they're around your gate. Replacing parts if necessary is also no problem for us, including the important sensors. 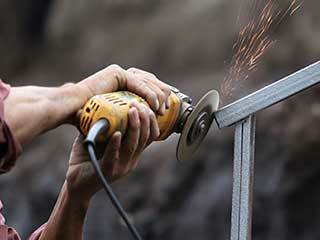 Upgrading your gate is a great way to improve the security of your home and business. We can put in gates that slide to a close for easy access in and out without taking up much space, or swing gates for a grander entrance. Whether you already have them in place but want to get a fresher look, or this is your first time getting them, our technicians will get them ready to go in no time. Call Garage Door Repair Oceanside now and let us help get your gates working like new again before you know it.